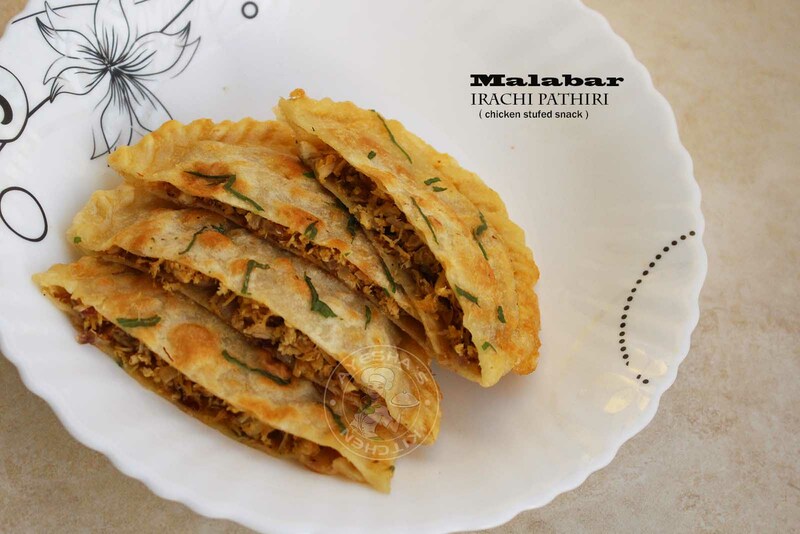 Again am back with an authentic Malabar snack recipe, Irachipathiri. As am from Malabar, I love sharing recipes related to Malabar especially all those traditional dishes that makes me feel nostalgic. 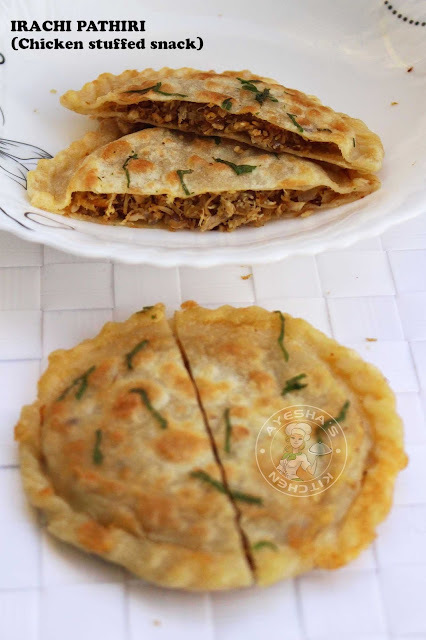 Irachipathiri / chicken stuffed tortillas/chicken stuffed snack is a very popular Malabar snack, especially during Ramadan. When I was a kid, my mom often prepares this snack at home for iftar. A spicy snack or chicken snack is compulsory for me and my sister for iftar. Having this chicken stuffed pathiri for iftar gives a special experience than in ordinary days. This snack was first introduced at home by my aunt. At that time I was surprised to see what is the stuffing, is it sweet or spicy etc. But as time passes, everything changes, even me. So let's move on to the recipe showing how to make malabar irachipathiri / stuffed chicken tortillas/chicken snacks / spicy snacks/ yummy recipes of Calabar / malabar vibhavangal/ kids snacks/party snacks. Making of shredded chicken - Boil chicken with some salt and turmeric powder. Drain the water when done and debone the chicken pieces. Shred it with your hands. Set aside. Making of filling - Heat oil in a pan and saute onion until light and golden. To this add all other ingredients given under ' for the filling ' one by one. Saute them well until the raw smell of spices disappears. Then add the shredded chicken. Combine very well and check for salt. Set aside. Making of egg batter - Mix together egg, salt, pepper powder in a bowl. Beat well. To this add chopped coriander leaves and set aside. Making of dough - Add plain flour, wheat flour, salt and oil in a big bowl. To this add lukewarm water little by little and form a soft dough. Now take a large lime sized dough, roll it out to make a big pathiri or tortilla or chapati. Now with the help of wide mouth bowl or any round object, cut out (about 4 inches in diameter) small tortillas out of this dough. Or you can roll out small lime sized ball to 4 inches in diameter. But it is time-consuming. Continue the same with rest of the dough. Take a small tortilla / pathiri, place some filling at the center, place another rolled out tortilla / pathiri over it, press the edges gently, and make pleats around the edges. And now, here I prefer shallow fried method for this Malabar snack. So heat a pan and place this prepared stuffed tortillas. Cook for a minute and then flip. Cook until both sides turn light golden over a medium low flame. Set aside covered (very important). When done, again heat the pan with ghee or oil. 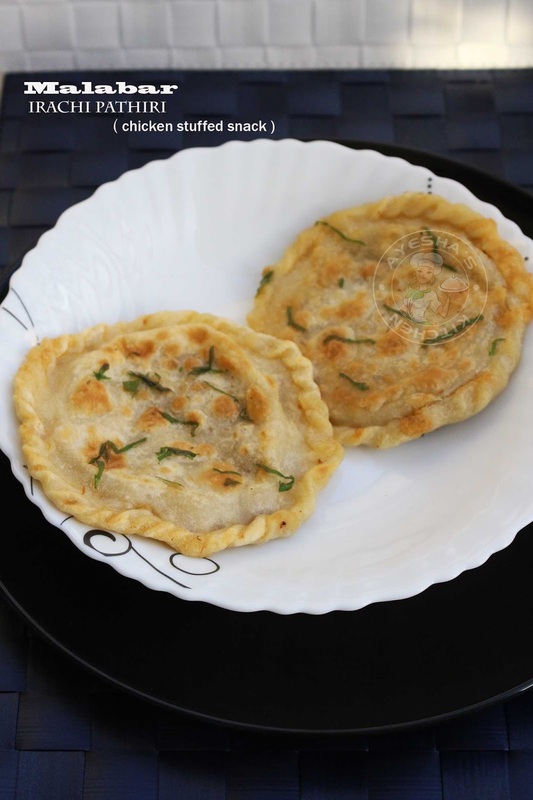 Dip these cooked stuffed tortillas in egg mixture and shallow fry until both sides are cooked.